Leila has a home! 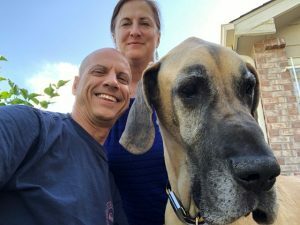 - Rocky Mountain Great Dane Rescue, Inc.
Leila has a home with her forever family, David & Julie, in Denver CO! David & Julie saw Leila on the website and were so excited to learn if they would be a good fit for her. With David owning a Dane in the past, and having rescued before, he and Julie felt that Leila was the right dog for them! She will be the only dog in their home, but will share her new home with Ollie, a 7 year old cat. David and Julie love to be outdoors, and go for daily walks in the parks around their home. They can’t wait to bring Leila with them, and look forward to all the new adventures they will have together! We are so happy for this sweet girl! Way to go Leila!